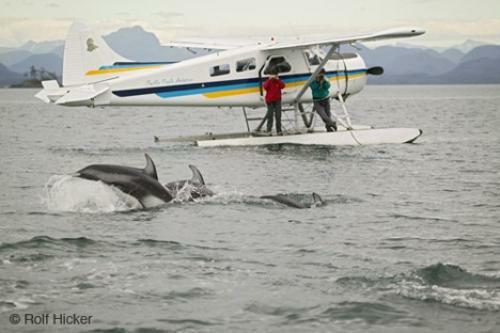 Tourists aboard a float plane not only get to see aerial views of the beautiful ocean and coastal scenery of Vancouver Island but also the playful antics of Pacific White Sided Dolphins turning on scenes of frantic activity as though on cue for a movie. A unique opportunity to take in the scenery and wildlife of Northern Vancouver Island is by a scenic float plane trip. Like a scene out of a nature documentary, Pacific White Sided Dolphins, aka Lags, frolic in the cool waters of the Pacific Ocean off Northern Vancouver Island. Pacific White Sided Dolphins are known for their acrobatic antics and scenes such as this are common when they play in the wake of boats especially, it seems, with an audience. Lucky for one couple, the pilot of this float plane saw the activity below and made a water landing in order to allow them to capture some close up shots of these delightful marine mammals. Pacific White Sided Dolphins are found in the temperate waters of the northern Pacific Ocean and are frequent visitors to the coasts of Vancouver Island. Photo of a scene of tourists watching a group of Pacific White Sided dolphins play in the ocean off Northern Vancouver Island.